Posted on March 24, 2019 at 8:25 pm. Terpenes, an important part of cannabis. Alpha-Pinene , sometimes referred to just as pinene or written α-pinene, is the most abundant terpene in nature. And it’s benefits are many. 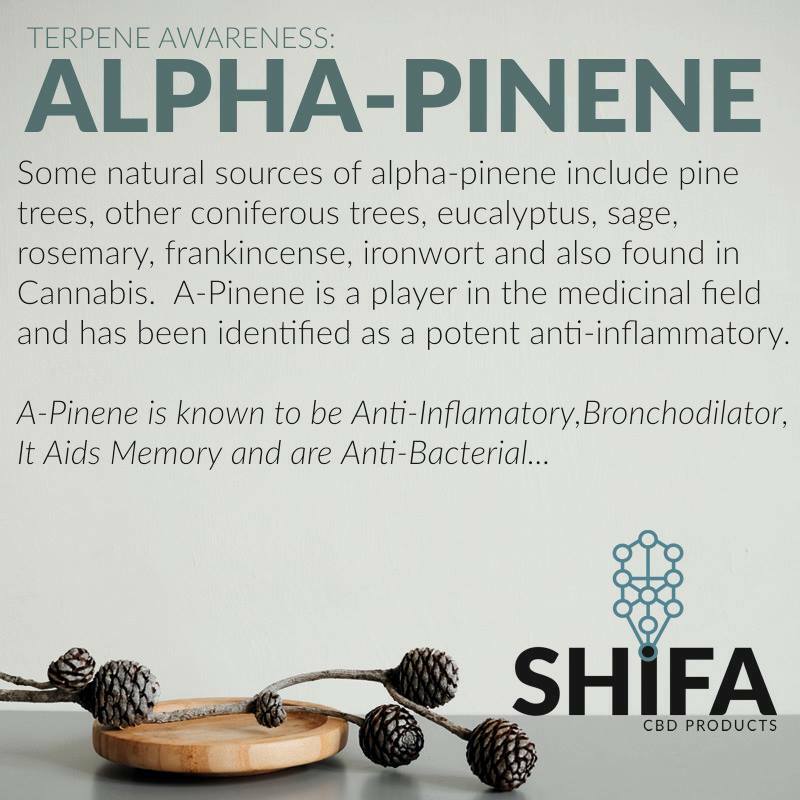 Research suggests that alpha-Pinene may have skin and oral health supporting benefits and may support the proper function of the immune and respiratory systems. Oils rich in alpha-Pinene are great for supporting skin health. Helping to keep the skin looking healthy and may help to reduce the appearance of blemishes when applied topically. Like its sibling, beta-pinene, alpha-pinene is most famous for its anti-inflammatory benefits. These are helpful for diseases like arthritis, Crohn’s, and multiple sclerosis. Working in synergy with THC, alpha-pinene acts as a bronchodilator, opening up airways at low exposure levels to help conditions like asthma. Working with CBD and CBN, it has a broad spectrum of antibiotic properties, which work against diseases like MRSA. Alpha-pinene can also counteract unwanted effects of THC, such as anxiety and short-term memory. It works by inhibiting acetylcholinesterase activity in the brain, which helps you retain memories more efficiently. Other benefits include euphoria, increased alertness, reduced oil production in oily skin, and most excitingly, anti-cancer properties. Studies suggest alpha-pinene can stop tumor growth and supplement chemotherapy treatments. Gastroprotective effect of alpha-pinene and its correlation with antiulcerogenic activity of essential oils obtained from Hyptis species. Scientists believe terpenes help create a better cannabis experience through a phenomenon called the entourage effect. The entourage effect describes how a combination of two chemical compounds may act together to produce a stronger effect than either compound alone. Terpenes like alpha-pinene may combine with different cannabinoids like THC and CBD, to produce stronger Cannabis sativa strains and other strains as well. In addition, studies suggest this terp acts as a bronchodilator in humans, increasing airflow to the longs and creating a better bodily experience consuming cannabis.